Introduced as a 4.5-inch centre height machine in January 1966 (from Serial No. 18970), the VSL was steadily developed to include a number of small but significant improvements to become the 5-inch Model 500 VSL. All versions are very desirable - but, unfortunately (especially the 500) difficult to find. Apart from a very rare, non-screwcutting, capstan-equipped export version with a "Harrison" label, the VSL was made only in Model AUD form with an under-drive stand, screwcutting gearbox and power cross feed. While early versions were very similar mechanically to an ordinary AUD - the most significant change being the fitting of a mechanical variable-speed drive system - some effort had also been made to upgrade the machine and, instead of cast-iron (used on all lesser models) the VSL, from first to last, had backgears in induction-hardened steel together with larger locating holes in the front face of the spindle bull wheel and, to improve reliability, the tumble-reverse gears ran on needle roller bearings. Later models were much improved by the fitting of a larger 1.375" bore spindle with a hardened and ground American Standard L00 taper nose and a 5-Morse taper socket - together with a short, hardened reduction sleeve (to take it down to 2-Morse) and an adaptor to accept direct-fitting C5 draw-bar operated collets (other Boxford models took a C3 collet in the same type of insert nose fitting). Fitted with a wide "expanding-and-contracting" V-pulley mounted directly on its shaft the electric motor was mounted inside the left-hand side of the cabinet stand. Pulley movement was controlled by a cable and rod system driven from a handwheel on the front of the stand. The upper drive pulley, which reacted to the movement of the motor pulley by opening and closing automatically, was carried in bearing hangers from which a second (conventional) link-type V-belt took the drive up to the headstock spindle. The speed range was typically 50 to 2000 rpm and, because the drive was infinitely variable, an electronic rev. counter (later a mechanical one) was fitted to show the operator what was going on (later versions were wired direct through the Forward/reverse switch, earlier types through a contactor, then through the forward/reverse switch). If the tachometer is broken or missing, businesses specialising in vintage car and motorcycle restoration can often help with replacement or repair. Quite why is not known (perhaps there were a special-order batch for industrial use) but some early 4.5" centre-height VSL lathes have been found with a motor having an extended left-hand shaft that carried a very expensive electro-mechanical disc brake, controlled by a switch fitted to the left-hand face of the motor-control panel. Nearly all VSL lathes were supplied, when new, with 3-phase motors - 930 r.p.m./1-h.p. on the screwed-spindle nose models and 930 rpm/1.5-h.p. for the L00 version. Unfortunately, because the drive mechanism fitted to them has to be accurately aligned to work properly, the VSL is difficult to change to single-phase operation. 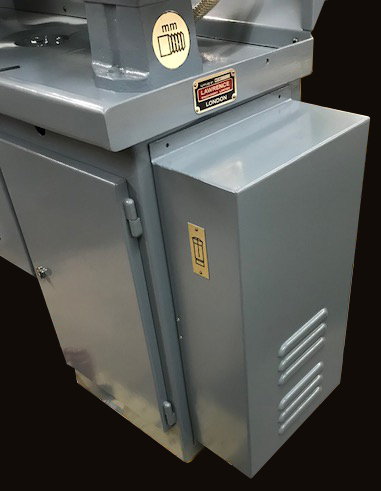 In addition, because the coolant pump, light unit and safety-interlock transformers are also 440 volt 3-phase (though some may be on step-down transformers to run at 110V), rather than attempt to completely re-engineer the peripheral controls, it is much easier to leave everything in place and run the lathe from a phase converter or inverter. If this is done it is worth bearing in mind that, while the main motor can be easily altered from "Star" 440 volt to "Delta" 240 volt working, many of these machines were fitted with both a push-button safety starter of the front panel and another "automatic" contactor unit at the rear. Because the coils in the contactors are 440 volt they usually refuse to work when supplied with the 220/240 volts put out by the inverter. Coupling the inverter (as is usually recommended by their makers) directly to the motor and bypassing the built-in controls has been known to produce a far more effective conversion. Of course, doing this means that the safety-interlocks on doors and backgear are lost and other arrangements have to be made to power the coolant pump and light unit*. Fitted to a distinctly different stand, and with a 5-inch centre height, the final version of the VSL was known as the Model "500 VSL" and, unlike most Boxford lathes, the model type was clearly identified by a large badge on the headstock. An interesting point concerns VSL models fitted with the L00 headstock spindle: on these lathes a screwcutting gearbox was standard - but some had different internal ratios and the English/metric and metric/English conversions gears arranged to be more compact with pairs of 64/54t and 76/65t respectively instead of the usual 127/110t (inch to metric) and 135/127t (metric to inch) gears. At one time it was believed that all gearboxes on the L00 VSL lathes had the altered internal ratios but several examples have been found in the USA (one being a VSL500 manufactured in 1977 with serial number V.S.L. 71861-L00) where this is not the case, the gearboxes being of the earlier, ordinary type. It is suspected that, while Boxford fitted a different gearbox to the earlier VSL models with the L00 spindle nose, this practice was discontinued and later editions of the manual not updated to reflect the change. If you buy a gearbox-equipped lathe that appears not to generate the pitches shown on the screwcutting plate check the special manual produced by lathes.co.uk, it shows all the ex-factory arrangement of the changewheels. 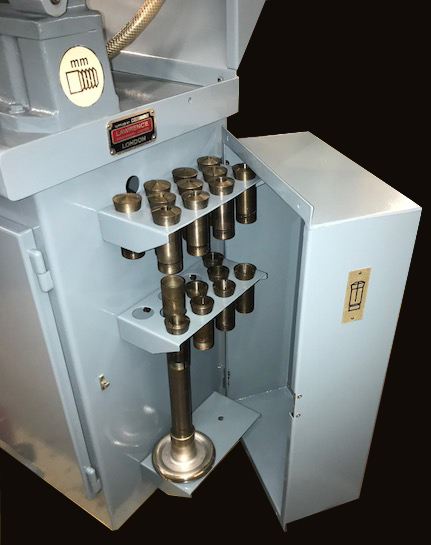 One less-commonly found accessory offered for the late-model VSL lathes was a full height cabinet on the left-hand face of the stand that held a set of C5 collets and the necessary draw bar. All the gears necessary to generate metric and other pitches are now available at a good saving on the factory price. Some Mk 1 4.5" VSL lathes (left) featured an electro-magnetically operated disc brake acting on the left hand side of the motor shaft and a different style of control panel, rev counter and switchgear built into the front edge of the stand below the screwcutting gearbox. The Harrison-badged variable-speed VSL500 was fitted out as a small capstan lathe with a quick-action collet closer, and lever-action cut-off slide. The headstock retained it's single-lever operated backgear for slow-speed use. If any reader has a sales catalog for this model, the author would be interested to hear from you. Fitted to a distinctly different stand, and with a 5-inch centre height, the final version of the VSL was known as the Model "500 VSL". Unlike most Boxford lathes some examples of this model were clearly identified by a large badge on the headstock. 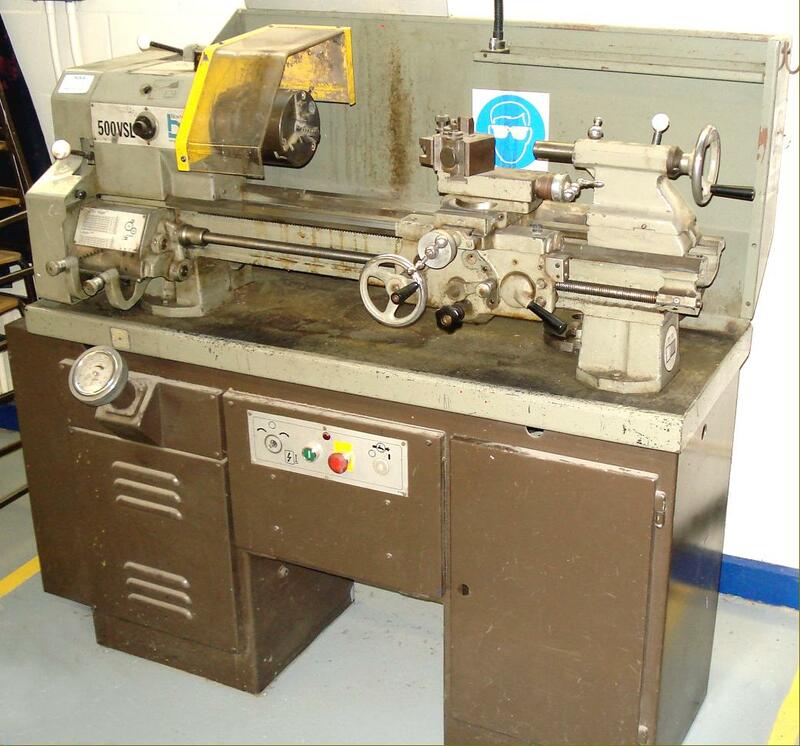 A detailed Manual & Parts List is available for all Boxford lathes.